The kingdom was created by Indo-Europeans who began to infiltrate into Bithynia in western Anatolia from the Balkans after about 1450 BC. Moving south and east, they settled the region a little way inland from the north-western corner of Anatolia, with Mysia and the Troad to their north-west. Linguistically, they bore some relationship with the Armenians who later occupied the mountains in the north of Mesopotamia in the kingdoms of Nairi and Urartu. The Assyrians possibly knew them as the Mušku, a name that first appeared in Assyrian records in the twelfth and eleventh centuries BC when these Mušku were penetrating into the Upper Tigris. Along with their eastern neighbours, the Kaskans, the Phrygians seized power in Anatolia after being involved in the fall of the Hittite empire. Thereafter, they found themselves bordered to the south-west by the neo-Hittite kingdom of Maeonia, with Mysia and the rest of the Troad forming part of their territory. A recognisably unified kingdom emerged by the eighth century BC, but the list of kings predates that and is influenced by Greek legends. Phineas of Thrace is rescued from an island which is apparently part of Phrygia, where he is being plagued harpies, by Jason of Iolkos during the latter's quest for the Golden Fleece. His dau, Hecuba, m Priam of Troy. In Greek mythology, Dymas marries his daughter, Hecuba, to Priam, king of Troy, while (according to Homer) his son, Asius, fights and dies in the Trojan War. Dymas and his Phrygian subjects are closely connected to the River Sangarius, which empties into the Black Sea, indicating their location in western central Anatolia. Prince Ascanius and Phorcys lead the Phrygian contingent from remote Ascania to the Trojan War on the side of Troy. Possibly the father of Daskylos, a king of Mysia in Greek mythology. The estimated dating for both kingdoms would seem to match up well enough for this indeed to be the case. Daskylos attempts to marry one of his sons to the king of Troy, although the boy is killed on his way to the city. The Mysians would appear to be recent arrivals in the region, just like the Phrygians, and are no doubt attempting to cement their position. Name unknown, and probably indicative of many missing names. The Great Tumulus of Gordion is long thought to be the burial mound of Midas (he of the fantastic fortune in gold). 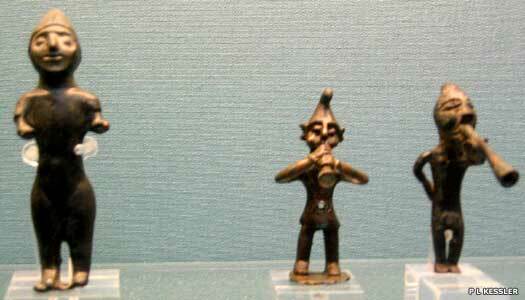 It is even called MM (Midas Mound) by the excavators who uncover it. But the dendrochronological analysis of the wooden beams used to cover the burial chamber later shows that it is constructed around 740 BC, very close to the presumed date of death of Gordios III. The tumulus contains rich finds which demonstrate the existence of contacts with Assyria, although these are not attested in written sources. In particular, the bronze vessels used for drinking wine at the deceased's funeral and subsequently buried with him attest to the shared elite culture: like privileged Assyrians all over the empire, the people of Gordion use animal-headed buckets to serve wine, and so-called omphalos bowls to drink it from, during large feasts. Possessor of 'The Midas Touch'. Committed suicide. Midas conquers several fortresses in western Que. The act seems to go unpunished by the Assyrians who are Que's overlords, possibly because Tiglath-Pileser III is heavily involved in campaigns in Syria. This may be one of the earliest incidents to involve Midas as a significant nuisance factor for Assyria. At the time Sargon's accession as ruler of the Assyrian empire, the use of Mušku certainly refers to the Phrygians. The trade connections that are evident from the previous few decades probably continue throughout this period. Despite sharing culinary and aesthetic tastes, Assyria and Phrygia are on bad terms. Although there are no relevant sources prior to Sargon's reign, his own inscriptions describe Midas of Phrygia as having long been a thorn in the empire's side, having never submitted to Sargon's predecessors and refusing diplomatic contacts. Now, Sargon's army conquers some fortresses in western Que which Midas of Phrygia had taken 'very long ago', indicating that Midas must have been in power for some time. This campaign results in an Assyrian foray deep into Phrygia but does not stop Midas from his continuing intervention in Que and Tabal. Much to Sargon's shock, while the main Assyrian army is occupied in the east, probably in Elamite lands, Ambaris of Tabal allies himself with Midas of Phrygia and Rusa of Urartu as well as the local Tabalean rulers in an attempt to invade Que. Sargon reacts quickly, invading Tabal and capturing Ambaris, his family and the nobles of his country, all of whom are taken to Assyria. Tabal is annexed as an Assyrian province. Sargon is noted for using Cimmerians within his army on this campaign, possibly for their knowledge of the Urartuan hills as much as their ability as mounted warriors. Cimmerians have been raiding into Anatolia and Mesopotamia for decades. In conjunction with Urartu, it seems that Phrygia (or at least its Cimmerian masters) supports anti-Assyrian rebellions in northern Syria and southern Anatolia. Lydia seizes control of the kingdom. Midas V / Mita of Mishku? The Persian defeat of the Medes opens the floodgates for Cyrus with a wave of conquests, beginning with Cilicia in 549 BC. Harpagus, a Median of the royal house and the main cause of the defeat of the Medes, commands Cyrus' army in Anatolia, conquering it between 547-546 BC. Taken during this campaign are Caria, Lycia, Lydia, Paphlagonia, Phrygia, and Tabal (Cappadocia), and Harpagus and his descendants reign thereafter in Caria and Lycia as satraps of the empire, normally within the satrapy of Caria. The attempt in 549 BC by the kingdom of Lydia to invade Anatolian lands which now belonged to the Persian empire saw an appropriate Persian response. Cyrus the Great invaded Lydia and crushed it, and then proceeded to capture the rest of Anatolia too. The kingdom of Phrygia and the minor city states of Caria also fell between 549-546 BC. Following that, a Persian layer of administration was introduced to replace the lost kingships. The new great satrapy of Sparda initially controlled not only the land of the former kingdom of Lydia, but also Katpatuka which had been the initial target of Lydia's aggression, the reason that Lydia had been conquered in the first place. More specifically, the great satrapy of Sparda consisted of the central minor satrapy of Lydia around its capital of Sardis, and the more peripheral minor satrapies of Hellespontine Phrygia, Greater Phrygia, Karkâ, and Skudra/Thracia (the last of these between 512-479 BC at which time Persian control was shrugged off there). The Ionian and Aeolian regions did not strike the Persians as clearly defined geopolitical entities, with the result that various descriptions are used for them. The former kingdom and now-region of Mysia itself was rarely important enough to warrant many further mentions in history, but subsequent references to it are handled under the satraps of Sparda. A reorganisation of about 480 BC seems to have given Phrygia more self-control, although it remained divided into Hellespontine Phrygia and Greater Phrygia. The capital of Hellespontine Phrygia was at Daskyleion (also shown as Dascylium), near modern day Ergili in Turkey and about thirty kilometres (twenty miles) from the coast of the Propontis. Probably founded by the Phrygians, the town was lost to history until archaeologists rediscovered it in 1952. A governor (or satrap) was appointed to oversee control of the Phrygian territories, but if this happened during the early days, when the two Phrygias were minor satrapies of Sparda, then there seems to be little record of its satraps. Selected for the post around 480 BC was Artabazus, a member of the Iranian Pharnacid family and the son of its founder, Pharnaces I. The family was directly related to the ruling Achaemenids themselves via Arsames, father of Pharnaces, a possible Persian king in his own right. Artabazus had served as a commander in Greece during Xerxes ill-fated campaign in 480-479 BC before gaining the post at Daskyleion. The geographical area of the Hellespontine Phrygia satrapy can be defined fairly exactly by reference to the cities attested as falling under the authority of its satrap, especially Pharnabazus in the second half of the fifth century BC. In the south the territory reached Pergamum and Gordium. In the east the province included Bithynia and bordered on Paphlagonia. Mysia was included within its area of authority, but was autonomous as a subordinate administrative unit. Governed by a local dynasty, each successive ruler had to gain approval from Daskyleion. The minor satrapy of Greater Phrygia in the south also included Lycaonia, Pisidia, and Pamphylia, and reached as far as the sea. This can be deduced from appointments made in Alexander's time, in the context of which Pamphylia and Greater Phrygia were again managed together. The coastal area of Greater Phrygia extended from the region between Celenderis and Coracesium in the east to Phaselis in the west. The course of the border from the latter point into the interior is largely uncertain, although Colossae was definitely still in Greater Phrygia. Further north the province was adjacent to Lydia. 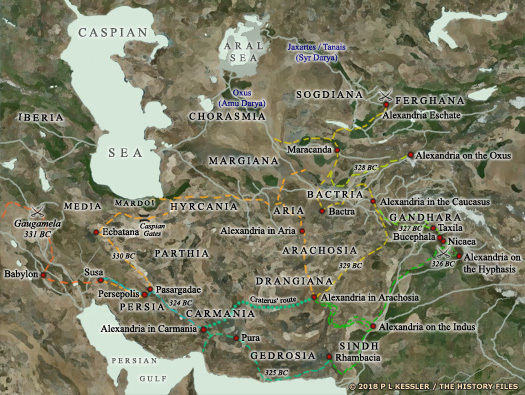 Indications about the province's northern border come from the facts that Gordium was already in Hellespontine Phrygia, whereas Ancyra was south of the Paphlagonian border. In the east the River Halys marked the frontier that further south met the Taurus ranges and followed them westwards around the edge of Cilicia. Satrap of Hellespontine Phrygia. Removed. Province seized. Oroetus, satrap of Sparda, has remained entirely unmoved during the many revolts against the new Persian king, Darius, providing neither help nor hindrance. However, he has already lured Polycrates, tyrant of the island of Samos, to his death and now takes the opportunity to avenge an insult by removing Mitrobates, satrap of Hellespontine Phrygia, and seizing the province for himself. When Darius sends him orders Oroetus kills the messenger, so Darius dispatches a 'volunteer', Bagaeus, who assassinates the rogue satrap. Satrap of Sparda. Seized Phrygia. Assassinated. Satrap of Katpatuka? Not verified. Ariaramnes is claimed by the unreliable Ctesias as satrap of Katpatuka while Herodotus, who is very reliable on Anatolia, does not mention him. The claim is that Darius orders Ariaramnes to cross the Black Sea to conduct a preliminary reconnaissance of the Scythian territories there. Ariaramnes brings back prisoners which include the brother of the Scythian king, and the resultant protests give Darius his excuse to go to war in Scythia. It is possible that Ariaramnes is instead based in Hellespontine Phrygia, as Katpatuka may not even be a satrapy at this time. Son of Megabazos. Satrap of Daskyleion. Son of Pharnaces of Persis. Satrap of Phrygia. Artabazus is the son of Pharnaces (Pharnakes, or Old Persian Parnaka), who is the brother of Hystaspes, satrap of Parthawa and father of Darius the Great according to Darius' own Behistun inscription. It is Artabazus who turns the satrapy at Daskyleion into an hereditary post which is held by his descendants - the Pharnacids. In 521 BC, Darius kills the usurper Gaumata (Smerdis) and seizes control of the Persian empire. Hystaspes and Pharnaces are the sons of Arsames (Arshama), son of Ariaramnes, son of Teispes, son of Achaemenes, founder of the Parsua dynasty in Persis. Ariaramnes and Arsames have been assumed to be a junior (cadet) line of the royal house, although their spans would seem to be rather long for the age in which they lived. Darius claims that both Hystaspes and Arsames are alive when he becomes king (as is Pharnaces, who becomes the king's chancellor in Persis). Whilst this is possibly for Hystaspes, could he be speaking figuratively in terms of Arsames? If he is indeed alive, he would be very old indeed, possibly approaching a hundred. Former aide. Rebelled, replaced in 363 BC, and executed. Ariobarzanus joins Datames, satrap of Khilakku and Katpatuka, in revolt against Artaxerxes II. Autophradates, satrap of Sparda, is ordered to suppress the rebellion and he manages to expel Ariobarzanes from the greater part of his satrapy. In 365 BC, Athens sends thirty ships and 8,000 mercenaries to aid Ariobarzanus. He rewards Athens with the gift of Sestos and Crithote, cities on the Thracian Chersonesus. In 364 BC, Mithridates (sometimes shown as Mehrdad), a son of Ariobarzanus, occupies Heracleia, the most important Greek city on the Black Sea coast. Soon all of Asia Minor (Anatolia) revolts against Artaxerxes II and, in 362 BC, even Autophradates is driven to join the rebels. Sparta, and also Takhôs, pharaoh of Egypt, send substantial help to the rebels. Two years later, having already been replaced as satrap of Phrygia, in 360 BC Ariobarzanes is betrayed by his son, Mithridates and is executed. Son of Pharnabazus? Satrap of Bactria (329-328 BC). Executed. Artabazus II falls out with Artaxerxes III and takes refuge at the court of Philip II of Macedonia. When Artabazus discovers Philip's designs to invade Persia, he returns there with his family, is pardoned, and is enrolled amongst the closest companions of the great king. His sons are given distinguished commands, with one son, Ariobarzanes, becoming satrap of part of Persis (at least, according to Arrian of Nicomedia, who calls him 'satrap' of Persis). Satrap of Paphlagonia. Non-Pharnacid. Committed suicide. Son of Artabazus. Continued to oppose Alexander for a time. Alexander the Great launches his campaign into the Persian empire by crossing the Dardanelles. The first battle is fought on the River Graneikos (Granicus), eighty kilometres (fifty miles) to the east. The Persian defeat forces Arsites to commit suicide while the region is incorporated into Alexander's growing Greek empire. Sparda surrenders but Karkâ's satrap holds out in the fortress of Halicarnassus with the Persian General Memnon. The fortress is blockaded and Alexander moves on to fight the Lycian mountain folk during the winter when they cannot take refuge in those mountains. The Argead were the ruling family and founders of Macedonia who reached their greatest extent under Alexander the Great and his two successors before the kingdom broke up into several Hellenic sections. Following Alexander's conquest of central and eastern Persia in 331-328 BC, the Greek empire ruled the region until Alexander's death in 323 BC and the subsequent regency period which ended in 310 BC. Alexander's successors held no real power, being mere figureheads for the generals who really held control of Alexander's empire. Following that latter period and in advance of several wars, the region was fought over between the Empire of Antigonus and the Lysimachian empire. Alexander settled the satrapal succession at its capital, Celaenae. The minor satrapy of Greater Phrygia in the south also included Lycaonia, Pisidia, and Pamphylia, and reached as far as the sea. This can be deduced from appointments made in Alexander's time, in the context of which Pamphylia and Greater Phrygia were again managed together. Greek satrap of Greater Phrygia & Paphlagonia. Died? Greek satrap of Greater Phrygia. Killed in action. Following the death of Alexander the Great, Leonnatus is appointed satrap of Hellespontine Phrygia. Then, a coalition of Greek cities springs up with the intention of detaching Greece from the Macedonians, including Athens and the Aetolian League. Despite two impressive victories in battle on land, the allies are undone when the Athenian navy fails to secure control of the seas. The Macedonians are able to bring in reinforcements and the war ends in victory for the Macedonians and their Boeotian allies. General Leonnatus has been killed in the process of gaining it, however, so Lysimachus gains this territory in the subsequent settlement of titles. Greek satrap of Greater Phrygia & Thrace. Antigonus was appointed governor of Lycia and Pamphylia upon Alexander's death, which included Canaan, Cappadocia, Harran, Paphlagonia, and Pergamum. Although Antigonus survived the first two successional wars with the other generals of Alexander's army, the Third War of the Diadochi (generals) in 314 BC resulted because Antigonus had grown too powerful in the eyes of the other generals, grabbing Babylonia, Bactria, and the Indo-Greek territories, and attempting to rebuild Alexander's empire. He was attacked by Ptolemy (Egypt), Lysimachus (Phrygia and Thrace), Cassander (Macedonia), and Seleucus (Babylonia) but came to terms in 311 BC after losing Babylonia to Seleucus. The Fourth War of the Diadochi ended in the death of Antigonus, but by then he had already established his kingdom in Greater Phrygia (306 BC). The other generals responded by proclaiming themselves kings the following year. General in Alexander's army. Satrap (334-306). Raised to king. Following the death of Antigonus at the decisive Battle of Ipsus, Lysimachus of Phrygia and Thrace gains much of his territory in western Asia Minor, including Phoenicia, and Seleucus gains more of it in the east. Antigonus' son and joint ruler escapes from Ipsus with 9,000 men and manages to retain the remaining territories for himself, thanks to jealousy between the four conquering kings. Son. Captured Athens and restored democratic system. At the start of his co-reign as king, Demetrius I frees Athens from the rule of Cassander of Macedonia and Ptolemy of the Lysimachian empire. Governor Demetrius Phalereus is expelled and the city's democratic system is restored. After ousting Antipater of Macedonia, and subsequently having his brother, Alexander, assassinated, Demetrius seizes the kingdom and rules his newly extended empire from there. During that time, he besieges Thebes and conquers it at great cost to his men. Equally careless of his own life, he suffers serious injury when a bolt pierces his neck. After attempting to re-unify Alexander the Great's empire himself, Demetrius is chased into Asia by his rivals, the other of Alexander's generals who are united in their opposition to him, and he surrenders to Seleucus in Babylonia. He dies two years after being imprisoned. His son, Antigonus controls no territory for two years afterwards, remaining bottled up in his capital. He marches against Ptolemy II Ceraunus of Macedonia in 283 BC but is defeated, so he returns to his reduced territory. The death of Ptolemy at the hands of invading proto-Galatian Celts in 279 BC certainly confirms his control of this territory, and now probably much of his father's former kingdom. Son. Defeated Celts. Occupied Macedonia 277 BC. Greece is still suffering under the invasion by Galatian Celts. Following a victory at Thermopylae, they are defeated by a force led by the Aetolians at Delphi in 278 BC, and then suffer a crushing defeat at the hands of Antigonus II in 277 BC. They retreat from Greece and pass through Thrace to enter into Asia Minor, forming a kingdom to the north-east of Phrygia. Antigonus is able to claim the throne of Macedonia, combining Thrace with the kingdom, which he is able to pass onto his son when he dies at the grand old age of eighty.